2 taken to hospital after crash involving Montreal police 'heritage' vehicle | C.O.B.P. 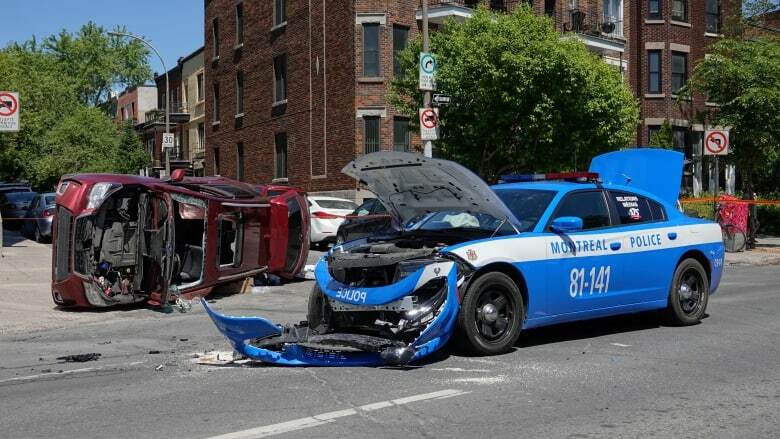 A Montreal police officer, and a man in his forties, were taken to hospital Monday morning after a police cruiser painted in retro colours slammed into another vehicle. According to police, the officer was chasing a vehicle that had gone through a red light on Sherbrooke Street when the cruiser struck another vehicle at the intersection of Sherbrooke and Cartier streets. "For some reason, the officer didn't see the vehicle," said Montreal police spokesperson André Durocher. The officer's lights and sirens were on. He said the injuries are not life-threatening, and that both of those involved were taken to hospital as a precaution.